County noxious weed in Becker and Koochiching Counties. Native to northern and central Europe. Introduced as an ornamental to Vermont before 1875. Escaped cultivation many times. Now naturalized in North America. A variety of habitats, including grasslands, forests, and wetlands, bogs, fields, roadsides, meadows, disturbed sites. This is an erect, perennial forb that rises on a rosette of basal leaves and a single flowering stem from a long or short, horizontal, underground stem (rhizome) and shallow fibrous roots. It is usually 6″ to 14″ tall at maturity, though some individuals may reach 24″ or more in height. It reproduces mostly by producing 4 to 12 aboveground runners (stolons) that creep along the ground and produce a new plant at the tip. The stolons are leafy and 4″ to 12″ long. It sometimes forms dense mats. Stems and leaves, when broken, exude a milky juice. The basal rosette consists of 3 to 8 leaves. Basal leaves are spatula-shaped to inversely lance-shaped, 1¾″ to 8″ long including the leaf stalk, and ⅜″to 1⅜″wide, 3 to 5 or more times longer than wide. Most leaves are no more than 2¾″ long. The leaf blades are wedge-shaped at the base and blunt at the tip. The upper and lower surfaces are covered with long, soft, straight hairs and short, branched, star-shaped hairs. The margins are untoothed. Basal leaves are present at flowering time. A single unbranched flowering stalk rises from the center of the rosette. The stem is covered with 1 ⁄32″ to ⅛″ long soft, straight hairs. Toward the top it is also covered with star-shaped hairs and stalked glands. There is sometimes as single leaf, rarely 2 leaves, on the stem. Stem leaves are similar to basal leaves but smaller. The inflorescence is a branched, compact, more or less umbrella-like array of flower heads at the end of the stem. There are usually 3 to 7, sometimes up to 12, flower heads in the array. There is a whorl of 13 to 30 or more lance-shaped to linear bracts at the base of the flower head (involucre). The involucre is 3 ⁄16″to 5 ⁄16″ long and bell-shaped. The bracts of the involucre (phyllaries) are covered with long, soft, straight hairs; short, branched, star-shaped hairs; and stalked glands. Each flower head is ¾″ to 1″ in diameter, has 25 to 120 or more ray florets, and has no disk florets. The ray florets are ⅜″ to 9 ⁄16″ long and orange to reddish-orange. Rays near the center of the flower head are usually yellow, at least near the base. The flowers appear from May to August, peaking in June. When they dry they become scarlet or purple. The fruit is a 1 ⁄32″ to 1 ⁄16″ long, single-seeded capsule (cypsela). The cypsela is round in cross section and narrowed at the base. It has 10 longitudinal ribs and a tuft of 25 to 30 or more white, barbed bristles attached to the end. It is dispersed by wind. No similar species. 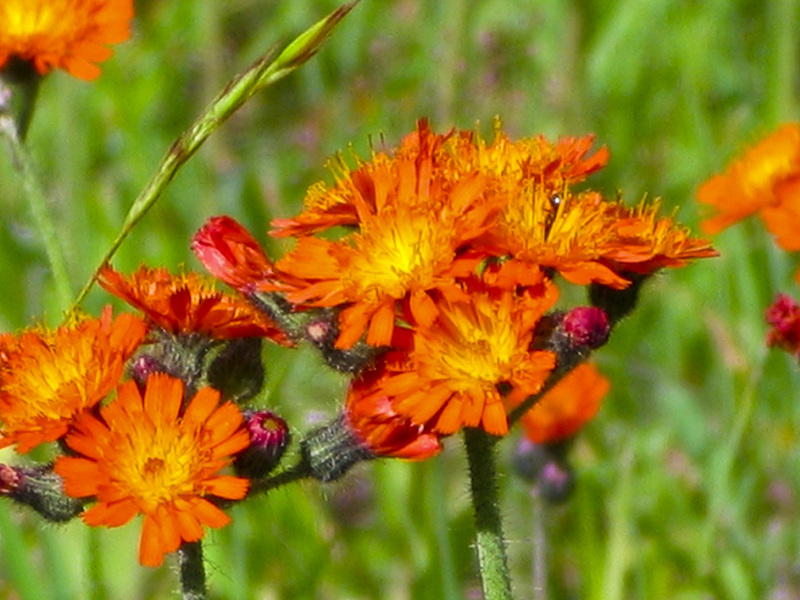 This is the only hawkweed with orange flower heads. 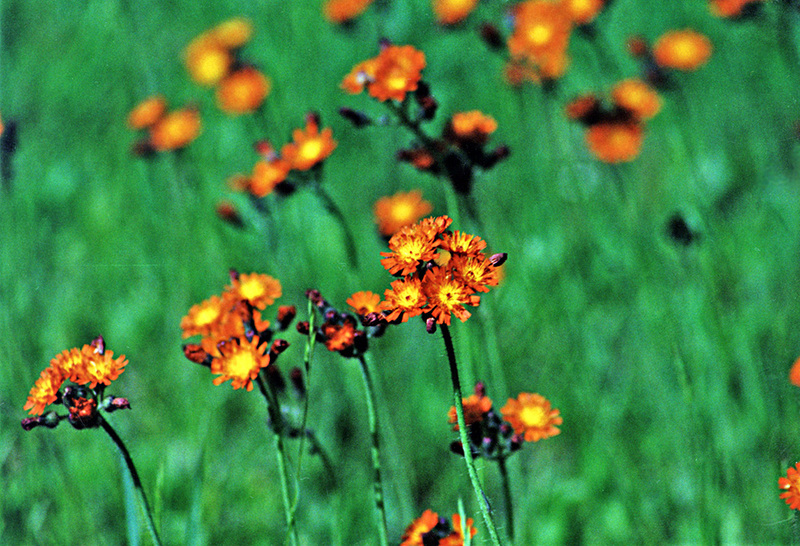 Until recently, plants in the genus Pilosella were grouped as a subgenus of Hieracium. Distinct features of the cypsela, absence of hybridization between groups, and, in some species, the presence of runners (stolons) and/or red lines on the lower (abaxial) ligule surface, support the segregation of these species into a separate genus. Some sources, including GRIN38 and The Plant List36, now classify this species as Pilosella aurantiaca. Most sources, including NCBI34, ITIS37, PLANTS3, UniProt33, FNA45, and Chadde62, continue to classify it as Hieracium aurantiacum. Pollen allelopathy occurs when the pollen of one species is transferred to another species. The transferred pollen then releases toxins which interfere with the growth of pollen tubes, the receptivity of the stigma or style, respiration, germination or growth of the seedling, production of chlorophyll in leaves, or production of seeds. 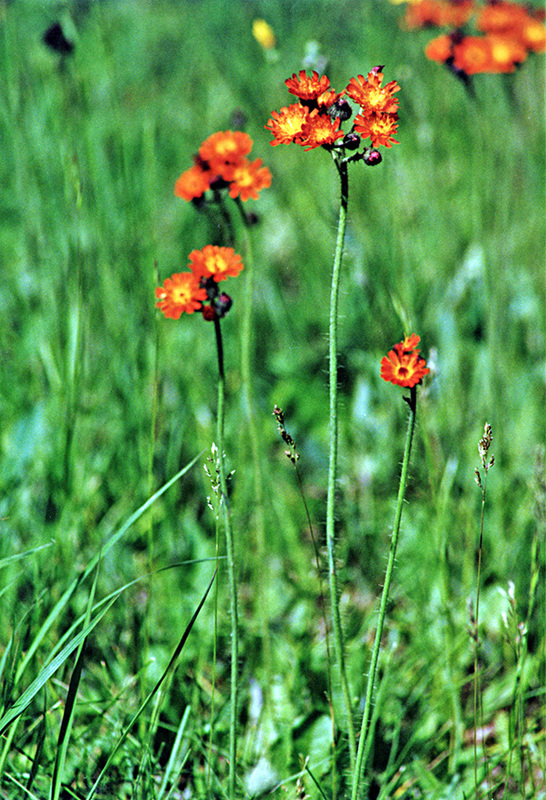 Orange hawkweed is one of the six known pollen allelopathic plants. The release of a chemical toxin by one plant to inhibit the growth or germination of nearby competing plants. 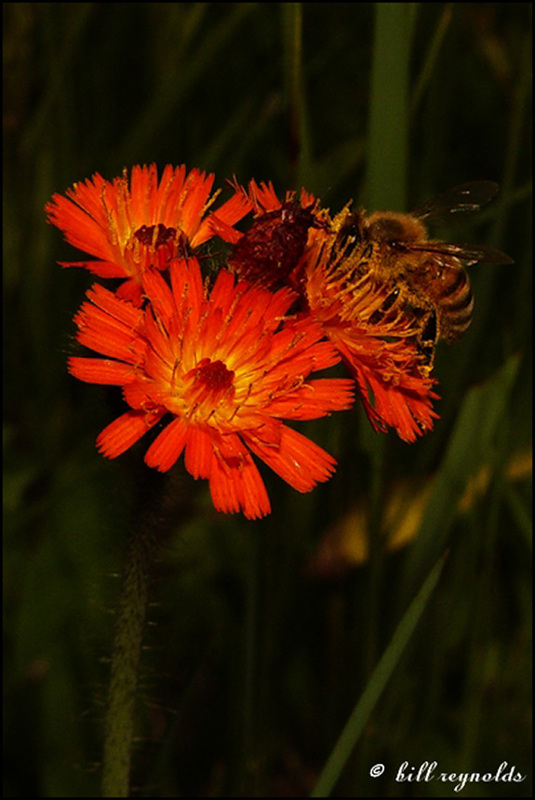 The hawkweed grew in great abundance in my yard in St Louis Co. My honeybees only gathered from the hawkweed in years there wasn't much else blooming. The Tansy was another one they wouldn't use much. 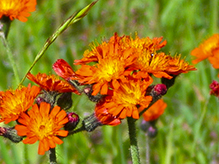 s "orange hawkweed" "devil's paintbrush"
Cz: Květinou je Jestřábník oranžový (Hieracium aurantiacum) a interprety písně Vždystřízlivci se skvělým sólistou. www.drnespor.eu: Svépomocné příručky, relaxační nahrávky, smích atd. Oblíbená jóga: www.biharyoga.net. Oblíbený čchi-kung: www.zy-qigong.cz, www.zyq.sk. Svépomoc: www.anonymnialkoholici.cz. AZ! Vše dobré! English: Enjoy! Original recording of a folk song by Weversober. 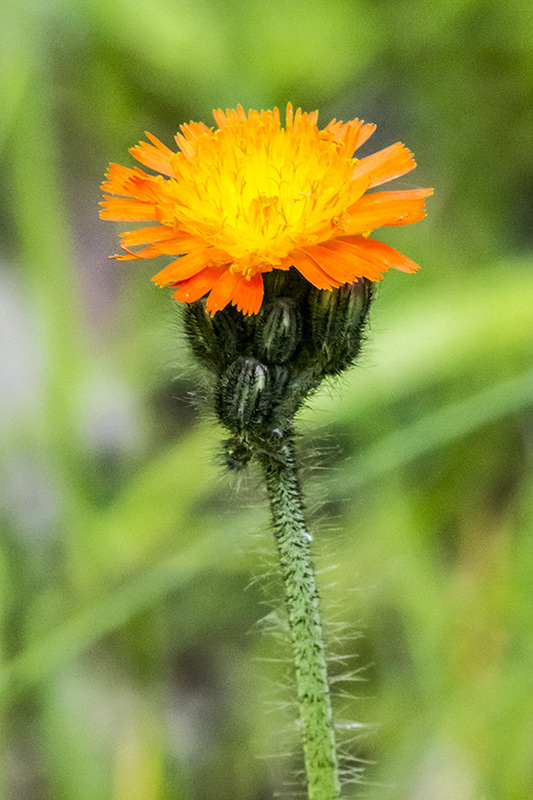 The flower is orange hawkweed or Hieracium aurantiacum. www.drnespor.eu: Papers, relaxation recordings, laughter, etc. My Favorite Yoga: www.biharyoga.net. My Favorite Qigong: www.springforestqigong.com, www.zyqigong.org. Self-help: www.aa.org. Best Wishes! Dan Sherwin, vegetation manager for Deschutes County, describes why the county wants to find and kill orange hawkweed. The pretty plant is an invasive weed. 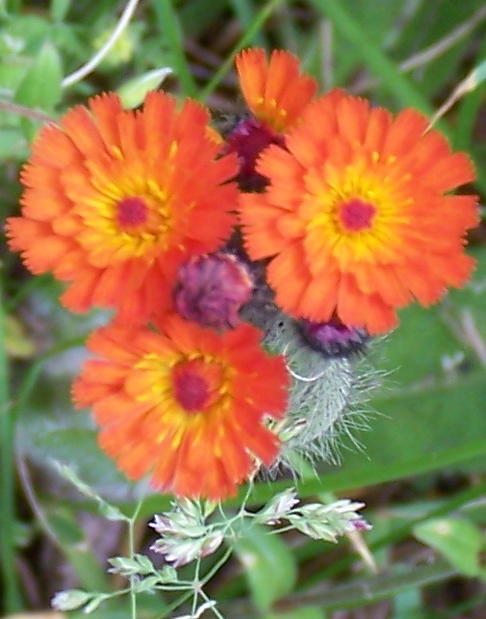 Pilosella aurantiaca (Fox-and-cubs, Orange Hawkweed,:208 Tawny Hawkweed, Devil's Paintbrush, Grim-the-collier) is a flowering plant of the family Asteraceae. 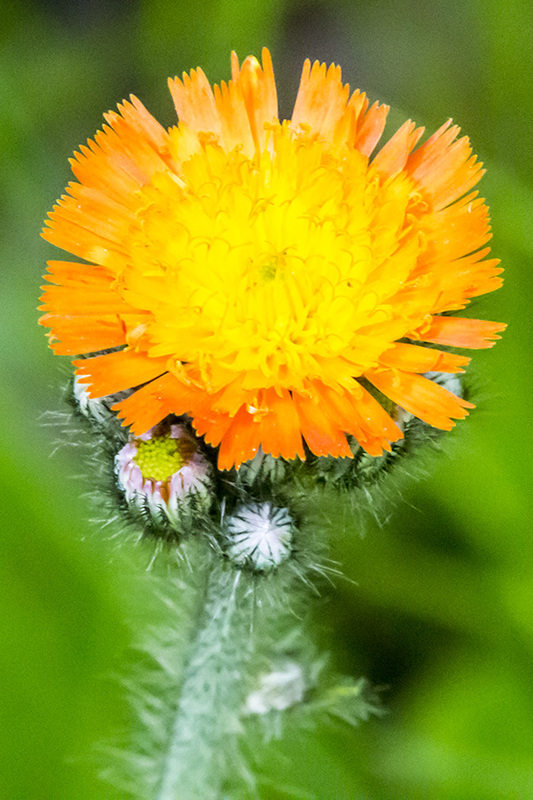 Oranje havikskruid (Hieracium aurantiacum, synoniem: Pilosella aurantiaca) is een vaste plant die behoort tot de composietenfamilie (Asteraceae). Dit exemplaar is bijna zeker verwilderd uit het nabijgelegen volkstuinencomplex "Ons Ideaal", daar staan er meer.